Hi, crafty friends! 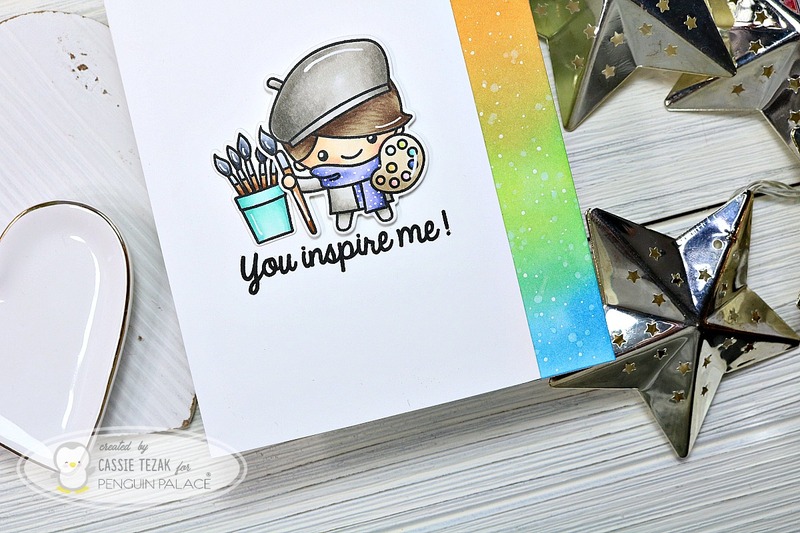 I’m back with a card I made to share with you all 🙂 I wanted to make a card using a glitter technique I saw Instagrammer Olga (@olga_moss) use recently. It results in a beautiful look that makes me want to stare at it all day! Let’s get started! To start my card I ink blended Peacock Feathers Distress Oxide into some Blueprint Sketch Distress Oxide. The two colors are so pretty together and give a gorgeous underwater look. I spritzed the paper with water to make some distressed spots, and let it dry completely. This alone would’ve been an awesome background for the sea creatures I wanted to use, but I wanted to take it one step further. Over the top of my ink blended background I applied double sided tape so that it covered as much as would be shown through my water die cut piece. If you had some Stick-It paper this would work even better, but I was all out! 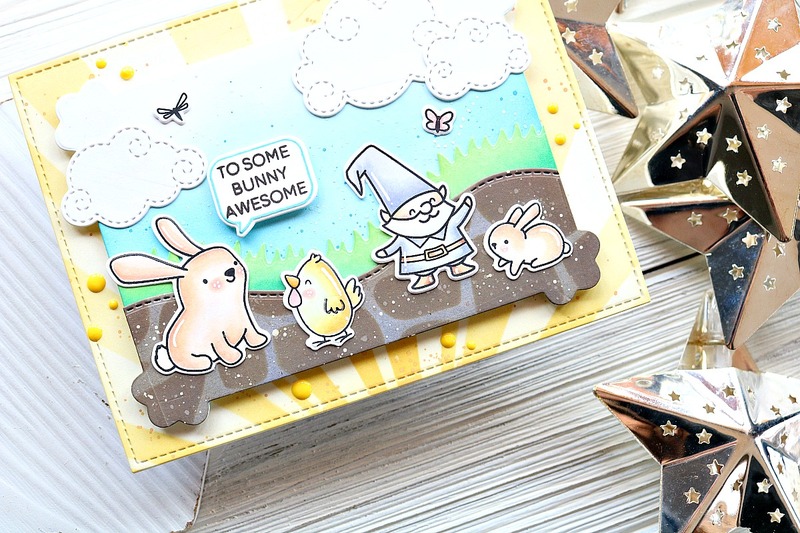 After that I sprinkled on some iridescent star glitter over the top of the tape and then used my finger to make sure everything was laying flat and even, and as much of the tape was covered as possible. I used a piece of scrap paper to lay over the top and really push it in to the tape and secure. There are probably ways in which to further secure it, or make it so that you don’t have any open adhesive, but I didn’t see this as necessary, and left it like this. 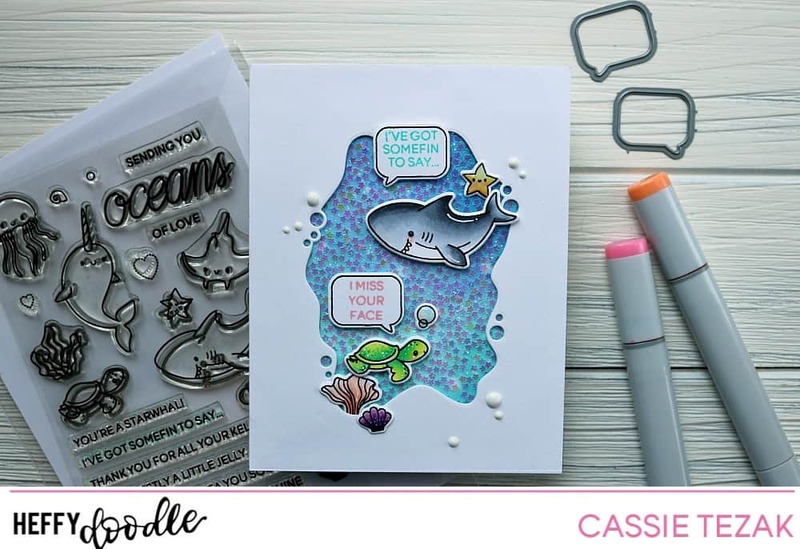 Next I stamped out creatures and scene building elements from the Oceans of Love stamp set as well as some word bubbles and sentiments from Whatcha Sayin’. 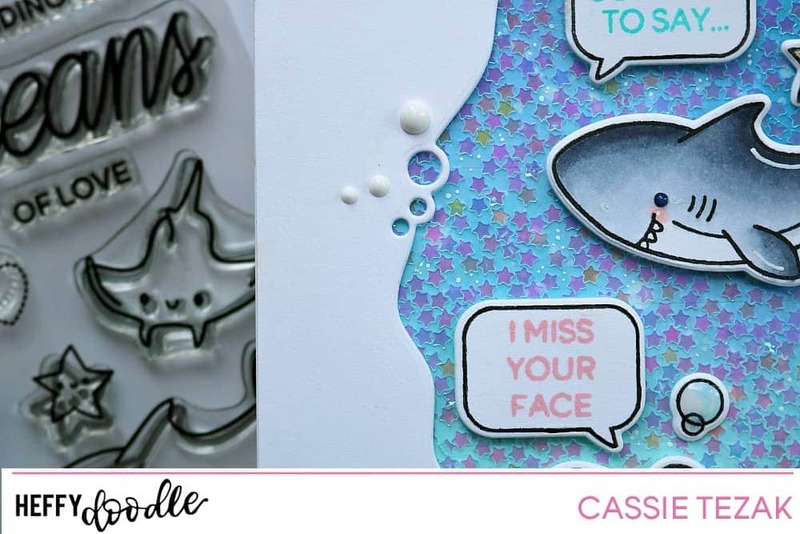 I die cut the the watery shape with bubbles with a Memory Box die and laid the panel over top of my glitter background. 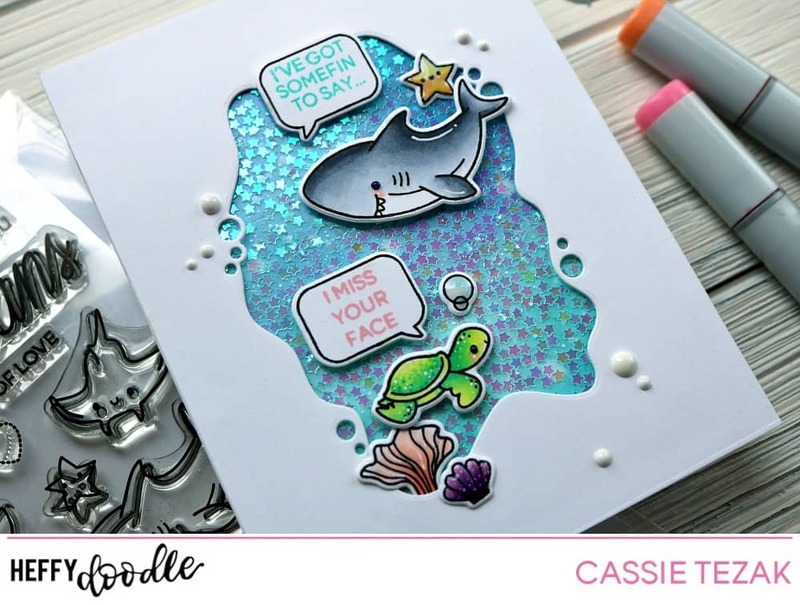 Then I started adding the cute sea animals and pieces, which I colored with Copic markers and die cut with coordinating dies. 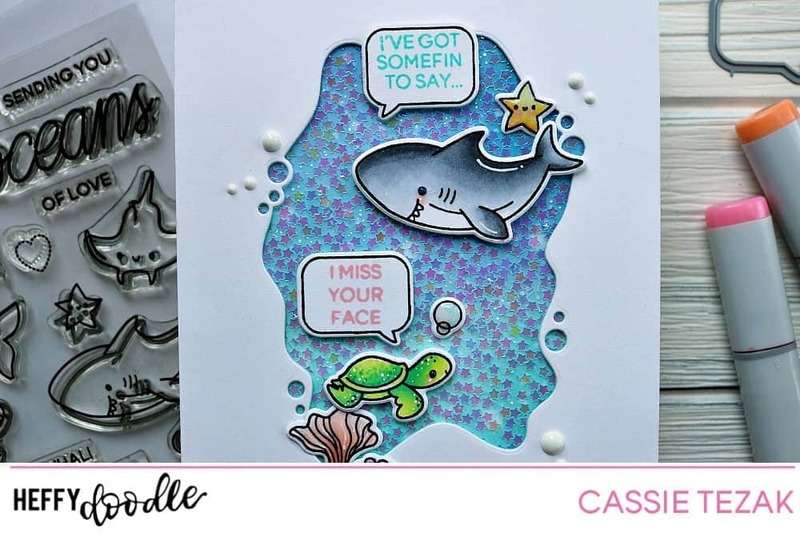 For the shark’s word bubble I did some masking to make sure the sentiment from Ocean’s of Love fit in the bubble! Once everything was in place, I adhered it down. The turtle, shark, and word bubbles were all adhered with foam tape. 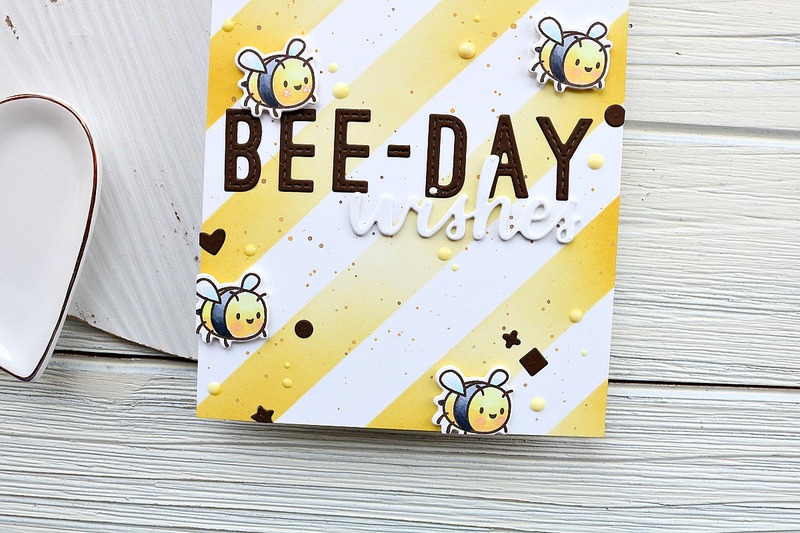 To add some finishing touches I added some details with white gel pens, Glossy Accents, and a few clusters of white Nuvo Drops. And that’s it for my card! I hope you enjoyed it. It’s the perfect bright and cheery scene for me on this gloomy, rainy day.